I know there are a lot of Gladz, former Gladz, and non-Gladz who have made some of their favorite memories of Gladz north of Edgeville. My hope is that this thread can be a collaborative ode to Gladz in the Wilderness. Please share any story, however important, from your encounters with Gladz. These don't have to be grand tales, it could be as simple as you and a buddy PKing while in Gladz. Or it could be a story of you pking Gladz if you like. Even if your memory is foggy and long ago, feel free to embellish it into a tall tale. In the era dominated by ZF and DI, Gladz were an inconsistent force in the F2P wild. In fact, we got spanked more often than not unless we had a big muster in which case we outnumbered most enemies and could contend with them. The taunt of the era was to ridicule others for having cheap armor and weapons (even in F2P) such as going as bringing adamant stuff or rune med helms or going as a ranger and not bringing full rune armor (which, at the time, was reasonably costly to acquire en masse). I noticed that our confidence in going F2P PKing spontaneously was waivering. It seemed hard to get people to come out and there was a growing sense that we couldn't compete with other clans if we ran into someone. I wanted to make PKing fun again. I also wanted to make the prospect of just getting into the wild inviting for people who weren't that experienced at PKing or maybe just felt intimidated by the demands of risking a lot of armor and weapons they didn't want to lose in the wilderness. So I led a series of PK events designed to purposefully goad the clan community by embracing our "noob" armor and weapons. The rule on these events was that you couldn't bring anything rune and that you intentionally tried to dress up like a hobo. People went out in chef hats, bronze chainmail, and steel 2Hs. This was even shittier than "1 iteming," we were deplorable. These trips were a lot of fun, regardless of whether we killed anyone or not. A lot of the time if we ran into any other clans, we would get crushed. We were pitifully equipped. But we died laughing, of course, and barely lost anything of worth. And on the off chance that we actually ran into some dudes who were in a small group PKing legitimately, we occasionally picked up a rune set or two out of the deal. The very act ran counter to the pressure of never bringing noob gear into the wilderness. By thumbing our nose at the clan community, we proved that we could have fun on our own terms. And I think for a lot of people who came out but who wouldn't have come out to a normal PK trip (i.e. the logchoppers), it was an especially enjoyable event because they found that the wilderness could be fun by intentionally risking nothing, clowning around, and occasionally terrify a random level 80 with your chef hats and bronze. More than anything, it got us just a bit more comfortable going into the big, bad, scary wilderness. And in an era where our confidence was low, it was a needed antidote to a clan that was frustrated with disappointment. Rune rock mining / pking other miners. Those were the good ol' days when 99 mining was an impressive achievement. Lost the majority of my old pictures but this one should have some feels. I think it was fir the DS war but i'm not certain. 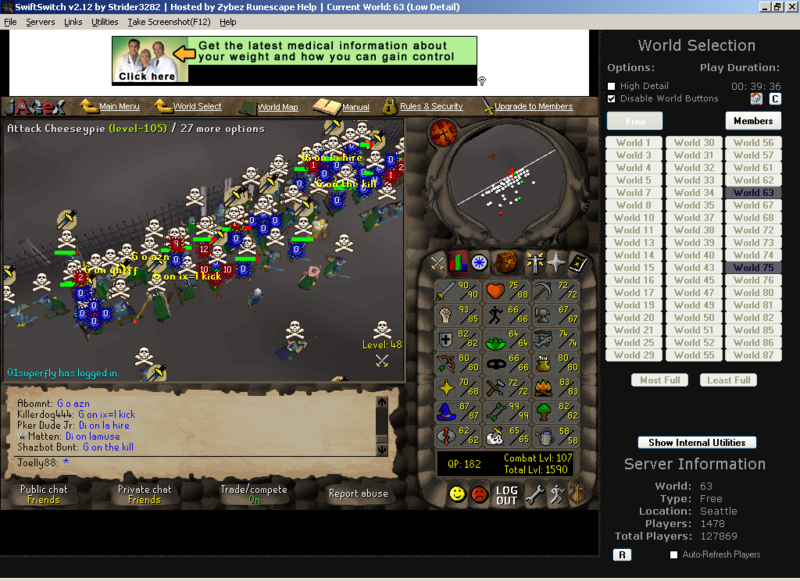 I'd say my favorite pking memory back with Gladz was somewhere in 2006, after we kept destroying TD in p2p with what should have been recognized as the first hit and runs, we had agreed to a 20 v 20 P2P capped miniwar. We thought it'd be hilarious if we all showed up in veracs, so all 20 of us showed up in Veracs and we ran through them in minutes. They started banking for welfare gear and came back up, I don't believe we lost anyone during the miniwar itself but If I'm not mistaken we lost 2 when they came back up with freezes. I remember ending up with a couple kills on their returners on my walk out of the wilderness, I believe Nalian and XarchofevilX followed me out then. I only remember about half of us that participated but I know it was Ewhenn, Geezerpunk, Destroyer25, Sayonaraman, Nalian, XarchofevilX, Sayonaraman, and myself. I really can't remember who else came, I know Destroyer25 took a video of it but I believe he lost it some years ago, but man I'd love to get a hold of that video that was pretty epic. Whoa. Didn’t know RS Community was still around after all these years - I thought they had died with EOC and the death of clans. Does tip.it still have a forum? Does this make Gladz also the oldest active RS forum? @Mkm2384 Nice! Was that our TS vs. DS? Sooooo many names I haven't seen in a long time there. @RafiI thought tip.it went bust years ago. Shame, I liked tip.it. This made me have feels for something that I never discovered when I was a young, dumb kid on runescape. No guides, no forums. Just having fun and figuring things out as I went. Some of my fondest childhood memories. My second fight in Crimson Raiders was against Gladz. I'm glad that it was a memorable smoking.